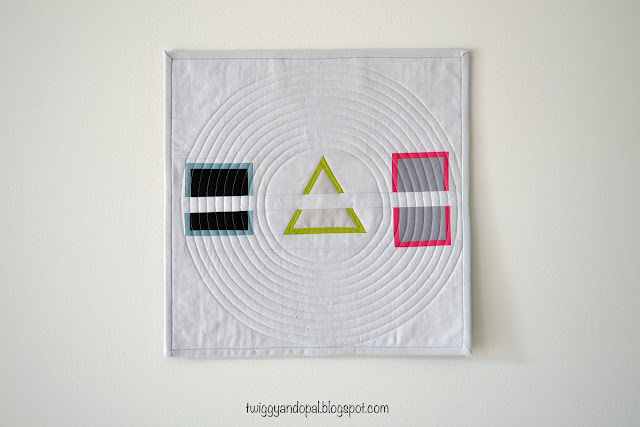 The truth is, I couldn't stop at two Minimal Mini's inspired by Curated Quilts! I was feeling the inspiration, feeling the vibe and just plain and simply...was having way too much fun! My first two mini's: Tendrils and The Square should have been enough, yet I couldn't end there. I had these ideas. This was the chance to finally get them out and into fabric form. The open entry deadline ended a couple days ago. I'm going to include the link to the entries so you can take a look at the playing field. There are some pretty amazing mini's and I don't envy whoever has to pick the few for the magazine! 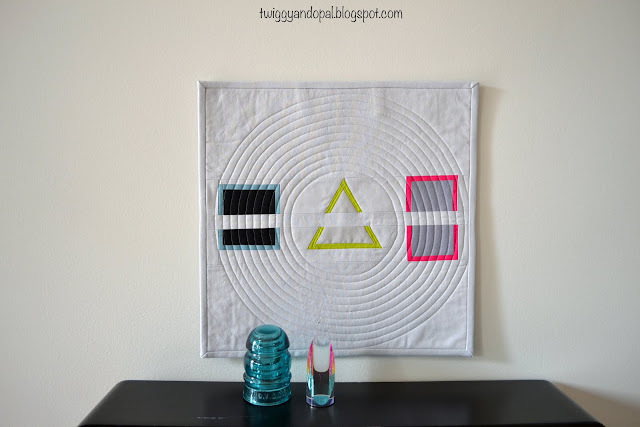 This link will take you to the link and post with the rules, Minimal Mini Quilt Link. The simplicity of a triangle. 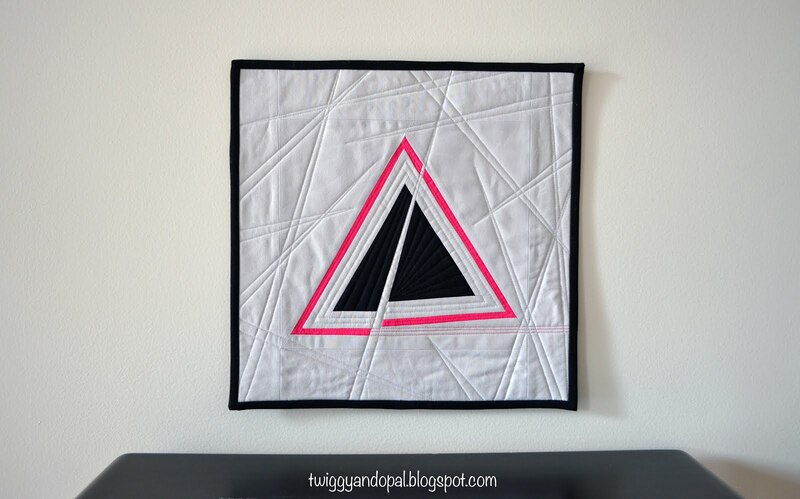 I simply framed the triangle with Kona Shadow and then with the bright pink. When it came time to slice and dice, I won't lie...I was a little freaked about it. Considering this was an idea I had, I wasn't sure it would come together. There were a couple head scratching moments, like making sure the top part of the pink frame was lined up when sewing the two sides together. Other than that it was straight forward! This time I wanted to keep it pretty simple with the quilting. 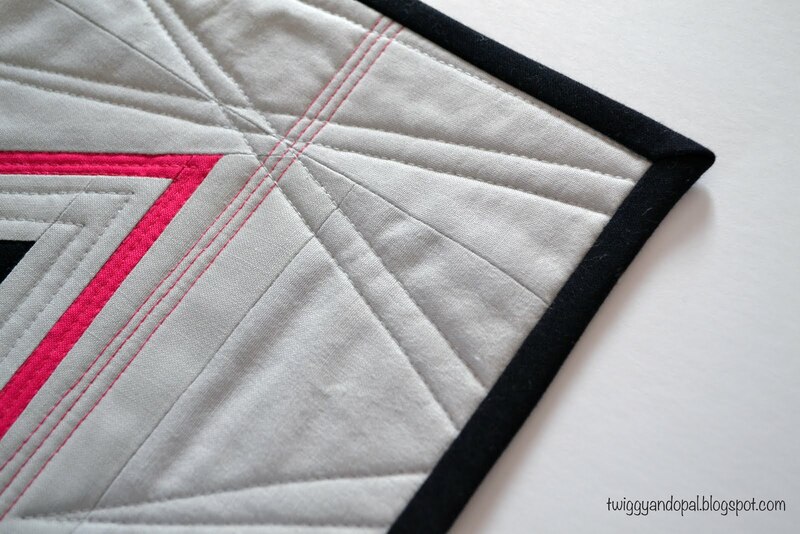 I used Aurifil Blossom Pink (2530) in the pink frame and continued the lines across the bottom. For me, this is pretty sparse on the quilting scale! That being said, I love it. 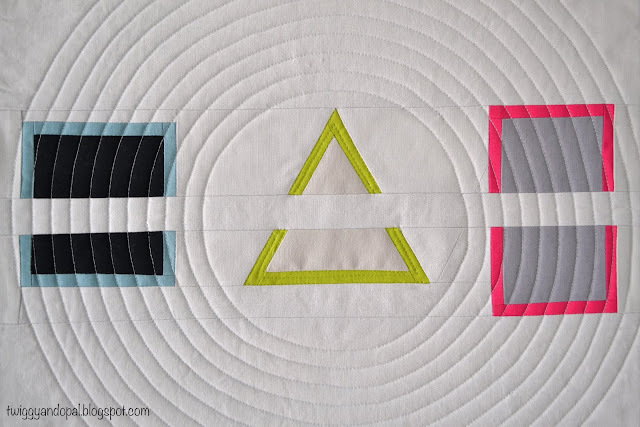 I like the simplicity of the design both in the quilting and the triangle. Simple is good! I really had fun with this one! I kept thinking of other ideas and what I really want to do or should or could have done. At some point you have to stay with the plan and focus! I stuck with a square, triangle and rectangle for my shapes. The blue, green and pink frames are 1/4" wide. Wide enough to see the color, but not glaring! While I really like this design, I wanted to use a circle for one of the shapes. At the time I didn't want to take the time...to make a darn circle! Call me lazy! I was more focused on getting it finished! So, when it came time to quilt this little jewel, it occurred to me that this was the perfect importunity to add that circle idea. Enter concentric circles! I no longer felt like a lazy slacker! I'm not sure how many Minimal Mini quilts will be selected for the next issue of Curated Quilts, and I wouldn't want to be the one who has to pick...and there are so many creative entries...and I'm crossing my fingers! A girl can hope! Very brave slice and dice work and you nailed it. Two wonderful minis, I have been going back and forth trying to decide my favourite, and I can't, I love them both. Lots of luck Jayne, I'm keeping everything crossed for you. I don’t want to sound like a broken record, but I really loved the challenge! If none make the cut it honestly doesn’t matter. What the challenge did for me was give me a starting point to try ideas and get inspiration. That to me, makes it so worth it! Simple is good! Yes and you rocked it, love these! I certainly loved this challenge! It pushed me to create something…and sometimes we need that extra push! Wow, you were really inspired by this challenge; I love it! 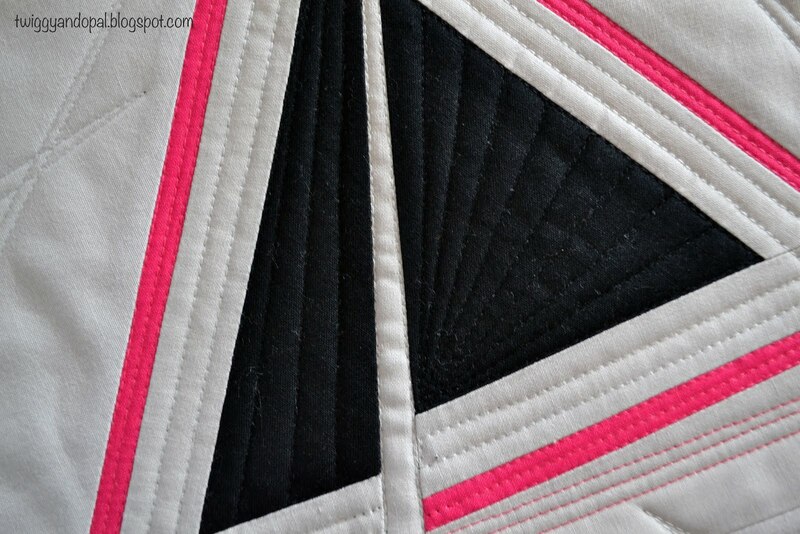 The concentric circle quilting for the last mini really messes with my eyes visually. Very neat! I was inspired! 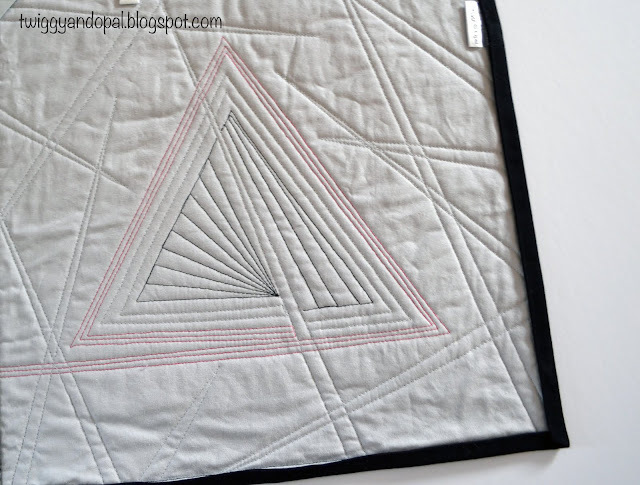 I think it was because of the theme and the set color palette…and mini quilts too! It made me stay in the lines…something I don’t do all the time! I love all of them! good luck to you.... there sure is a lot of talent out there, but you're at the top! Oh I like them! I love the pop of Pink - it makes your mini shine! Yes, it would be very difficult to pick just a few quilts for the magazine, but if I could pick just one to have for my very own, it would be your "Split." Design, colors, quilting--every detail appeals to me! 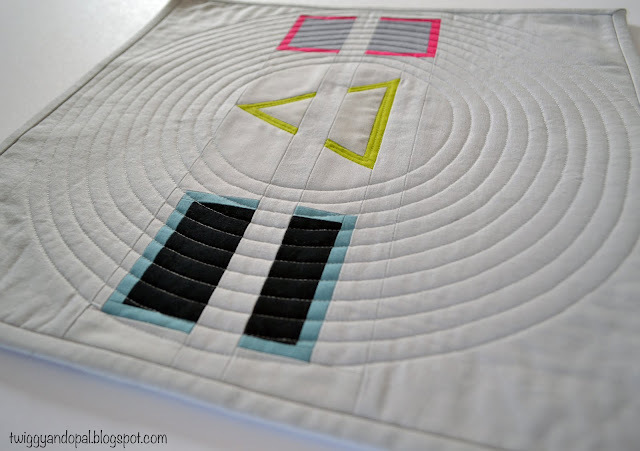 Great bold colours paired with wonderful quilting! Lovely minis! Your posts are like beautiful little jewels that arrive in my inbox to brighten my day. Thank you, Jayne! Love both of your mini quilts and will keep my fingers crossed. There are those who step up and take the challenge and I applaud you but there's me who like to see the end results. There is something about making mini quilts which is so rewarding to the heart and mind. Nice work, Jayne! What inspired you most about the challenge? It's obvious that you were truly inspired. Jayne! These are both SO great!! I hope your work is included in the gallery...in some form or another! Either way, you have created a gallery of your own with this challenge! Most excellent! It may very well be a gallery of my own! The challenge brought out the best in everyone and it’s going to be hard to pick a few! It also make me want to explore shapes a little more. 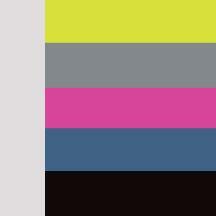 Who knows, maybe I’ll make another ‘mini’ gallery using my own color combinations! Boy you sure did this challenge justice! Every one of yours is so creative and unique - yay for exploring. I loved the topic but just didn't have the time and space to try this time. snif. Sure hope at least one of yours is selected! Awesome work - I love them both! Thanks for the link to the Minis, they are stunning, and yours are too! You were very brave to cut through the triangle like this, and you were right! The pink fabric is delicious, I love it! 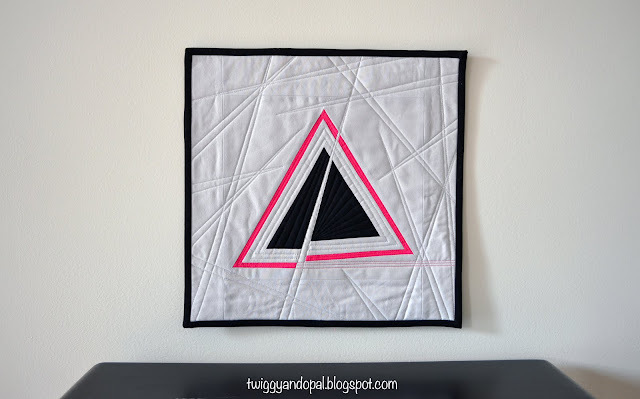 Love the triangle with the pink, pure perfection. You are just so darn creative and inspiring! I really love Configuration. I can't wait to hear which ones get selected for publication. Thanks for sharing with Oh Scrap! Can you tell that I had fun with this challenge?! Four…a little over board! It would be great if one of mine would be selected…there are so many to choose from! These are so inspiring! 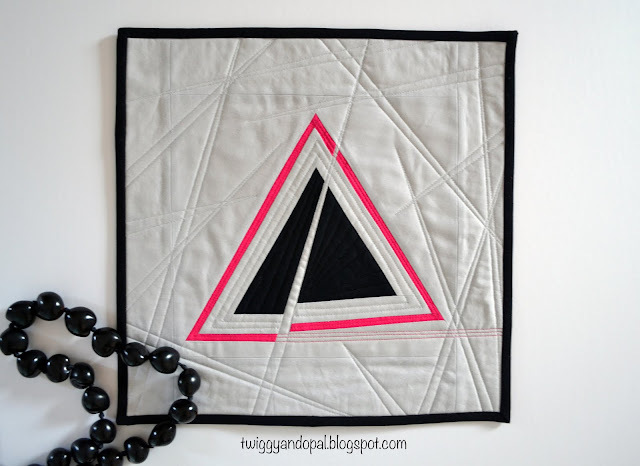 Minis are just so much fun and your triangles provide great inspirational sparks for my own quilts. They should both be winners. The triangle piece is so dynamic and the amount of Quilting just right. The second lets the colors shine and the circle Quilting encloses it while giving movement. They inspire me. You are on a creative roll. Well done. I hope at least one of your designs gets chosen. Good luck. Wow, just wow. You have nailed the minimal, and the quilting choices on each of them elevate the work even more. 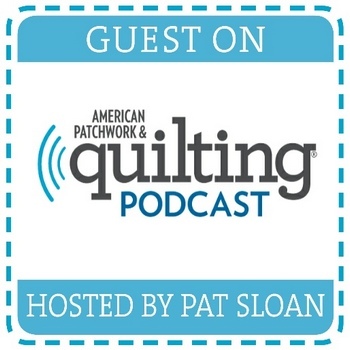 I am now eager to see what shows up in the next Curated Quilts issue. Thanks for linking up with TGIFF! 2018 is off to such a creative start for you!! 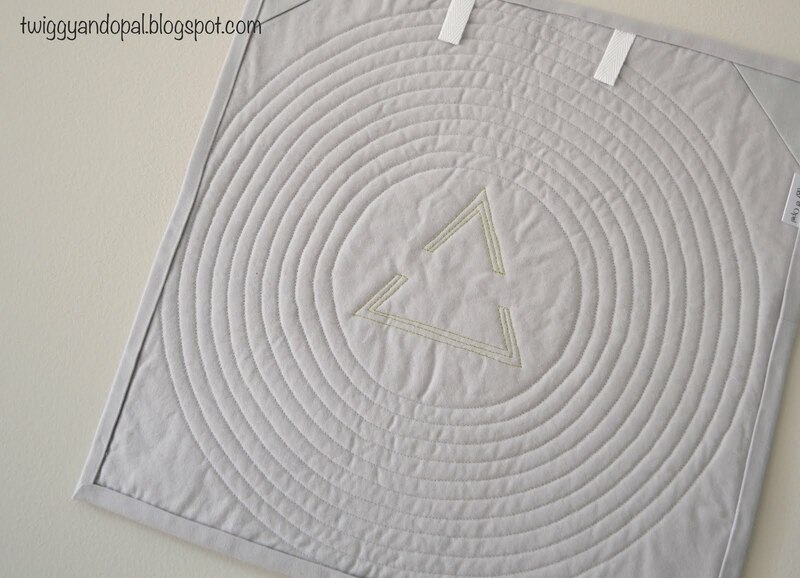 Love them both - the concentric quilting on the second one was the perfect idea.